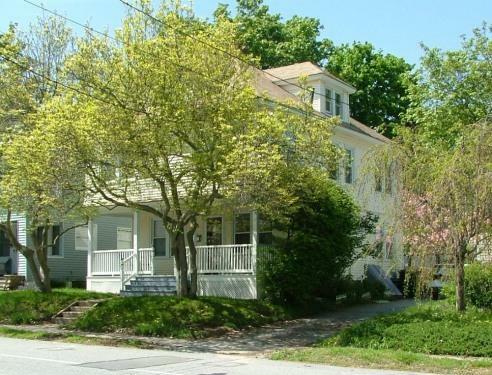 Sunny & Charming 6 bedroom 1910 colonial is 4 houses away from Private Beach with new kitchen, 2.5 baths (1 is newly redone), hardwood floors, stone fireplace, 1st floor washer and dryer, oil heat, new windows, and private beach rights on Long Island Sound. The house is four doors from the beach with a partial view of the water down the street. We are about 15 minutes from the Coast Guard Academy and from the US Navy's Submarine School and Sub Base New London in Groton. We are located one block from Ocean Beach Park, 10 minutes from Eola Mansion at Harkness Memorial Park, and 30 minutes from the Branford House at the University of CT in Groton, CT. All of these three facilites offer seaside weddings. The first floor has two living room areas, dining room, new kitchen, and 1/2 bath. The diningroom can seat up to 16 with our extra table. We also have a new set of dishes for 16 and linen table cloths for both tables. So, you can have a formal or casual dinner. By the way, this room is 30 foot long so there is plenty of room for the tables. The other end of the dining room is a sitting area with a couch that matches the one in the living room. All rooms except kitchen and baths have hardwood floors. The second floor has a remodeled bathroom and 4 bedrooms (2 queens, 1 full and 1 bedroom with 2 twins). The Third floor has two bedrooms and a full bath. One bedroom is walk-through and is configured as a family room with a full futon that will sleep two and a twin. (there is also a full air mattress for the futon.) The other bedroom has two twins. The house is in a quiet family neighborhood. We do not rent out for parties. In consideration of our neighbors, yard activities must end at 10 p.m. Beach access is limited to tenants. You must be at least 25 years of age to rent this property. The driveway holds 3-4 cars. There is limited street parking in summer months. Check in is after 4 p.m. Checkout is at 11:00 a.m. From June 1 to Labor Day weeks start on Saturday unless specifically noted in our rates. We accept credit cards through Paypal. If you do not have a Paypal account, you can easily set one up. A credit check may be required. Dogs are allowed at the beach from October through April only. BEACH Lounge Away your Stress on our White Sand Beach. The home includes beach rights on private Neptune Park Beach which is a lovely white sand beach on Long Island Sound. From that beach you can look out on the open water and see sailboats, ferries, commercial shipping, fishing boats, an occasional submarine or tall ship, 2 lighthouses, and Long Island in the distance. (Some local beaches are at the mouth of the river so the view is of the industrial sites across the river.) You can also launch a canoe or kayak there. The beach has three distinct sections separated by rocks. One has a diving and sunning platform, another is a small cove, and the third is an open expanse of white sand. Sitting on that part of the beach, you can almost feel like you are in the Caribbean! September is the best time at the beach, crowds are gone and the water is still warm. In the fall, winter and spring, enjoy a walk along our beach and adjacent Ocean Beach Park. (I like to have my morning coffee this way.) Enjoy a casino weekend or Thanksgiving and Christmas away from the city noise. ACTIVITIES The Kids Won't Be Bored Here, and Neither Will You. They can play volley ball, miniature golf or video games at Ocean Beach Park which is just 1 block away. The park also includes a public beach, restaurant, health club, a bar with waterfront deck, ice cream stand, gift shop, nature area, boardwalk, concerts, cruse, night, magic night, movies, playground, water spray park, health club, and an outdoor swimming pool. Or visit an 1839 fort, complete with cannons, at Fort Trumbull State Park which is just 5 minutes away. Name entertainers perform at Mohegan Sun Casino and at Foxwoods Casinos. You can experience live theater at the Eugene O'Neill Theater, which is about 10 minutes away. Tour a Nuclear Submarine, a Real Whaling Ship or a Vineyard In 30 minutes or less you can be at the Mohegan Sun Casino, Foxwoods Casino, Mystic Seaport (tour old whaling town and authentic ships), Mystic Aquarium, the U. S. Navy's Submarine Force Museum (tour a real nuclear submarine and simulators), the U. S. Coast Guard Academy, as well as the many fine restaurants. Or see a baseball game with the Connecticut Tigers, an affiliate of the Detroit Tigers in Norwich. There are also vineyards located north of Norwich. We have lighthouses. And you can take a fishing or sail boat cruise. Tour Mansions of the Golden Era or go Yachting Tour the grand old mansions of the Gilded Era (circa the Vanderbilts and the Astors) in Newport, RI, which is an hour away. Or experience the yachting lifestyle at America's Cup Charters. Their Twelves all raced for yachting's most coveted prize, and three actually won the America's Cup. Participation is welcomed but not required! Get involved in the sailing or just sit back and enjoy the sunset on picturesque Narragansett Bay. Boston and New York City are a few hours away New London is a stop on Amtrak's new Acela high speed train line that runs from Washington to Boston. The trip is about 2.5 hours from New London to Penn Station in New York City. There is also access via Interstate Highway 95 and via ferry to Long Island or New York City. New York City is about a 3 hour drive via 95. Long Island is 1 ½ hours by ferry. The drive is about 2 hours from Boston and 1 hour from Providence. Newport, RI is also 1 hour away. A public transit bus stops nearby. There is an Amtrak station, a ferry port, and car rental in downtown, New London. You can also catch a bus there for the casinos. I am a computer software consultant. I came to the area for a software project over 20 years ago and loved the area so much I bought a place here. My family rented the home for a polka festival that was taking place at Ocean Beach Park. We stayed at a different home last year and was not happy with the property. Immediately after returning home, I contacted Gloria about renting her property for 2016. She was wonderful and answered all questions promptly as they came up through the year. The house was warm, welcoming and very large. We had 11 adults through the week and everyone had space. The house had all ammenities that you could need at a beach home. We especially loved access to the private beach. It was breath taking and more than we imagined. The group loved that we were a short walk to the entrace to Ocean Beach Park. Needless to say we rebooked for 2017. If you are looking for a well kept, spacious beach home rental, I highly reccomend this property! Owner's reply: Thank you Mary Jo. We look forward to seeing you again in 2017. Very charming New England traditionnal two story home. Like going back to when I was little kid visiting my grandparents home. Close to the beach and all the local attractions i.e. Casino's, Mystic, Sub Base. Very cozy with all the amenities like cable, internet, coffee maker etc..... Too cold to swim at the beach when we were there but close enough to enjoy a walk on the beach. We have a lot of memories in this neck of the woods and will definitely be going back to enjoy a little warmer weather next summer. A special thanks to our hostess Miss Gloria for making everything just right. Highly recommend this home for a week at the beach in the summer or the weekend in the fall. We will definitely be going back. Thanks so much for letting us stay. * Adequate accommodations for three families in a fully furnished house. BBQ grill was a plus for meal preparation. Heating system was very responsive. *Great value, especially as compared to any other suitable options *Beach within short walking distance. *Charming house and setting! Enjoyed iur stay very much! Great house, great location. We had 11 guests from 3 different families. Plenty of room for all! Very short walk to the beach, which was absolutely gorgeous! Gloria was very easy to communicate with and quick to respond to any questions. If you are travelling to the area, this house is highly recommended! The house was exactly as described - accommodation for members of four families who gathered for Thanksgiving worked very well (children from 10 months to 17 years). It has a well-used feel. Active toddlers and small children felt immediately at home and parents relaxed to find no mahogany or leather furniture or precious breakable knick-knacks around the place! The kitchen is well-equipped; sixteen people sat down at a set table on Thanksgiving day. Everything was very clean (no greasy pans or surfaces!) and there were loads of towels. The washing machine and dryer can take huge loads. There was plenty of hot water and the heating was immediately responsive when the thermostat was adjusted. As soon as you leave the porch of the house Long Island Sound is in view to your left - beach walks and playgrounds are merely a stroll down the street. Plenty of paper products are provided. Internet worked well. There are no nearby grocery stores, but the fridge and freezer are big. The house is very close to neighbors on both sides, but neither house was inhabited while we were there. In warm weather with windows open, I can imagine the neighborhood might be very busy. However, proximity to the private beach can not be beat. Gloria was very responsive and friendly - and she returned our security deposit promptly! We will definitely consider returning. Owner's reply: Thank you for your kind words Sarah. I am glad your family enjoyed your visit. If you decide on a summer visit, you will find my immediate neighbors are relatively quiet and donâ€™t generally open their windows because of A/C. Walking traffic is usually only from next door and around the corner neighbors, and a few folks out for a stroll or jog. Car traffic generally takes another route to the public beach. We appreciated your clean, warm, attractively decorated house --- large enough for our big family! The great grandchildren had fun at the beach and the Mystic Aquarium and playing games. It was so very special being with our precious family. Thank you for this opportunity. All eight of us had a wonderful Thanksgiving in your lovely home. The days were warm and beautiful and the house was warm and happy. Thank you for allowing our family to have a glorious reunion and give thanks for our many blessings. We really enjoyed our week-end in this lovely home. We came here to celebrate my 70th birthday with our children, their spouses and our grandchildren (13 of us). The weather has been very warm for December so we spent much time outdoors. On Saturday we drove into new London to welcome Santa who came to town on a tugboat. The following day we went ice skating on the Conn. College ice rink and then came back to a lovely birthday dinner. The holiday decorations certainly added a great touch! Thank you for opening your home to us. Thank you so very much for opening up your home to us. Family members and friends came to New London from across the country. Our father, Don S. Bellis, USCG Academy class of '56, was inducted into the Academy's Hall of Heroes "Wall of Gallantry". This weekend was a very special time to hear stories of his career and to share memories. Those of us who stayed for the rest of the week took the opportunity to visit Plymouth, Cape Cod, Mystic Harbor, Newport and Foxwood Casino. Thanks once again and God's peace. to themselves or their memories, the Coast Guard, and their Country. Our family arrived from all over the country to celebrate the marriage of our son. Coincidently we were able to attend our son's graduation from the Submarine Officers Advanced Course in Groton, CT. As well as celebrate our parents 59th wedding anniversary. We had the rehearsal party here and the wedding was at the Branford Mansion in Groton on Avery Point. We visited Mystic as well as Newport and enjoyed the beautiful beaches down the street. Our weather was beautiful except for rain on the last day. Thank you for this lovely, well-stocked home. Searching for a place to celebrate my mother's 70th birthday was a bit of "fear of the unknown "... on the Internet. We took a ride and decided this was the perfect place for our family's gathering. You have thought of everything to accommodate a charming vacation treat. It is wonderful to share the gift of time together and this was just perfect with all the comforts of home - We love the sugar sand beaches and the clear "rockless" water, our walks were delightful. Thank you. We gathered together our family - Mom and Dad (Nana and Granddad), 3 siblings and spouses, 4 grandkids - for a week of fun and relaxation. This is our 2nd annual trip to 35 Neptune. We enjoyed it just as much as we did last time! The beach is fabulous. Walking distance, nice sand, private and uncrowded, floating dock ... lots of fun! It's super that we can all stay here together, and eat together too. Thanks for such a well-stocked, comfortable, clean place. The accommodations were just great and "homey". You seem to have provided most everything we needed. We had perfect weather all week. The 3 little ones loved the beach, with the 2 older ones going to the raft and back repeatedly. We really enjoyed the privacy of the beach. It was easier to identify "our" children that way. The porch was a popular spot after the beach - with adults sharing cocktails and the children pretended it was a ship. Especially enjoyed the handmade quilts, as I am a quilter myself. We hope to return! Our weekend party of eleven women had an amazing time at 35 Neptune. We arrived on Friday and departed Sunday - all sad that we didn't have just one more day. We were here celebrating my upcoming wedding. I didn't want a traditional bridal shower, but rather I wanted to spend time with women in my life - a chance to talk, eat, play games and sit on the beach and watch the sunrise. We came from Virginia, Pennsylvania, Rhode Island, New Hampshire, Connecticut and Norway! Mothers and daughters, grandmothers and sisters. Before we all return to our home a few of us will visit the Spa in Mystic/Groton for pampering and beautification In less than 4 weeks, I will marry the love of my life and will do so knowing I have the love, support and blessing on an amazing group of women. I am very fortunate, indeed. Thank you for opening your home to us and helping make this wonderful weekend possible. We had a blast. My immediate family was here for the beginning of the week and the rest joined us for the end of the week. We all came from Mass. We had great walks on the beach, went to Mohegan, the Aquarium and bowling. Most of all we had lots of fun just being together at the house. We even set up our own casino and played blackjack. We came to celebrate my dad's 70th birthday and retirement and it was well worth it. We did get snowed in one day , but we had fun with our casino and charades and a talent show. What a week we have had in this charming home! There were 3 generations ranging in age from 3 to 70 years! All had a ball at the beach - so nice that it is private! We saw old friends and relatives, who joined us for dinner - that made it so special. Thanks for your hospitality. Great weather to sun and swim on the perfect beach, walking, running, fishing, biking, boating, gaming ... We did it all, and had a fabulous time. We are so glad we found 35 Neptune on the Internet. The layout of the house gives teenagers their space. The dining area has the room needed for all to enjoy meals together. The fenced in backyard allowed our beagle "Mickey" and our welsh corgy "Scooter" the enjoyment of no leash running. All in all a very good setup for a vacation home. We gathered for our 15th annual Thanksgiving celebration. The house and the beach were lovely. New addition - baby Audrey and Nora pregnant with twins. We were especially grateful to be able to have the house because several members of our party were not able to attend in 2007. The weather could not have been better! Sunny and warm for late November. Our three families gathered for the first time in just over three years. We celebrated the return of the youngest brother who recently returned form a 2-year mission in Guatemala. The weather began cold and we had a little snow, much to the delight of the CA and TX families. The wind changed and it turned mild and rainy, which dampened some of our outdoor activities. But we still walked on the beach and enjoyed it very much. We had a lot of fun being together, eating at Cove Fish Market, ordering pizza twice (Ocean Pizza!!) watching movies, playing games, visiting great grandparents in Groton, and looking at mission pictures. It was great to be able to be all together in one house with plenty of space, where we could put them to bed and enjoy grown-up time. It's a fun old house and has plenty of space for old and young. Thank you very much for letting us use it for the week. Thanks for the Christmas tree. We loved it!